Pictured above: Chef Neil working on new menu ideas! The Food & Beverage Fair is this Saturday, June 20th and will feature creative food ideas from Chef Neil's kitchen, wine and beer sampling from Beau's, MacKinnon Brothers, Steamwhistle, Malivoire Wines, Hobbs & Co. Wine Merchants plus more. The event runs from 6pm to 9pm. This is a great chance to find out about what we have in store for the club this summer or introduce new people to KYC. We also want to get your feedback about the types of food and drink you want to see at the club this summer. Members are $20 and non-members are $25. 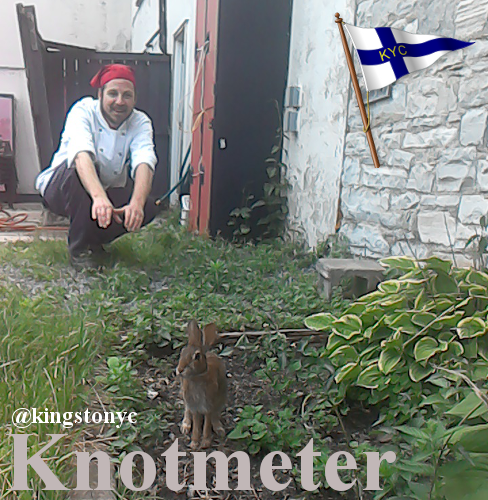 Please e-mail James at bar@kingstonyachtclub.ca to reserve. This week our feature draft tap is back by popular demand! We are featuring Smithworks Brewing Company's Dunkelweiss, a complex, yet refreshing dark wheat beer. Up next is Beau's Festivale, their summer seasonal beer. On Saturday June 27th, KYC will be hosting brewery tour to MacKinnon Brothers Brewery in Bath. There will be samples and a tour with their brewmaster. Chef Neil and his team will prepare lunch to go with the Beer. For those who want to cruise down to the Village of Bath's docks, there will be a shuttle running from there to the Brewery leaving at 12:30PM. 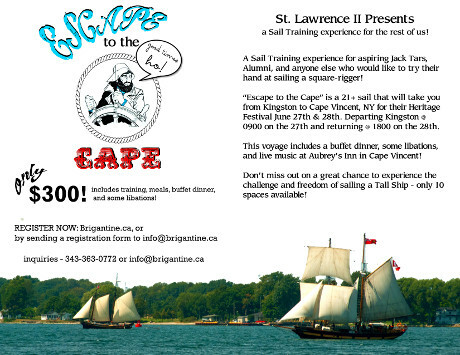 Email James at bar@kingstonyachtclub.ca to reserve your places before they are all gone! June weeknight and weekend racing is well under way! The Single/Double Handed race was held last Saturday (12 boats participating) and the Harbour Race is this Saturday(Skipper's meeting at 9:30 and start at 10:30 between mark "P" and the flag[pole. The (Practice) Sprints event will be rescheduled to a more opportune time. 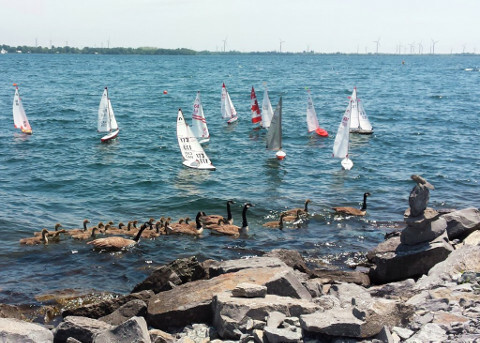 If you were around the club this past weekend you would have noticed 20 small boats sailing off the breakwater, it was the 2015 Radio Controlled Soling Canadian Championship. He got great starts and hung on to finish with six firsts and two thirds, Congratulations Paul ! I would be amiss if I didn’t mention the great help I had in running this regatta. I would like to thank Ross Cameron, a man of many hats around KYC, we are very fortunate to be able to call on his talents whenever the need arises and he never refuses. We had a great group of volunteers. The scorer was Lana Butler (in Montreal )race recorders were Maggie Daicar, Mabel Corlett, Joan Kraszewski and Mary Wilson who took care of the score board. These four kept the regatta running very smoothly. After each race Maggie and Ross would huddle and take pictures of the score sheet and then send them into cyber space to Lana in Montreal and within minutes the results would appear on the KYC website. AMAZING! We also had the crew of John Clay and Peter Kraszewski at the turning marks keeping everyone honest. Tim Garrett and sons did an awesome job operating the crash boat and laying marks. KYC is very fortunate to have such dedicated volunteers. I would like to thank the KYC staff for the efficient and friendly service they provided. Everyone involved in this regatta commented on the good food that they had, both at lunch and dinner. The Heritage Committee has re-discovered a piece of Club history hidden for c30 years under a pile of debris in a Saints Rest ground floor storeroom. We have named it "Big Bertha" which some members may recognise as the nick-name for a gigantic WW1 field gun. Our Bertha may not be able to shell Paris from 75mi. (120km) away, or indeed shell anything at all because it is a 125lb (57kg) signalling cannon. Please click on this link, to read the whole story and perhaps help us with suggestions of how best we can display this mighty piece of ordnance. June 19 Weekly TGIF Club BBQ!